Hello, forex friends! Another non-farm payrolls (NFP) Friday is coming up (September 7, 12:30 pm GMT), so buckle up and read up on today’s Forex Preview, since the Greenback will likely be taking us for a ride. Oh, also note that Canada will also be releasing its own jobs report at the same time, so read more about that here, if you’re interested. In my previous Forex Preview for the August NFP report, I noted that “the available leading indicators seem to be pointing to weaker job creation during the August period.” I also noted that “payroll numbers for the August period tend to be lower due to seasonal adjustments.” Moreover, forecasts by economists tend to miss expectations. Well, that’s what actually happened back then. 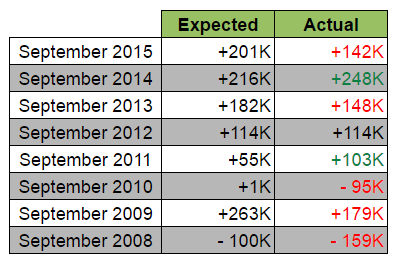 To be more specific, non-farm payrolls came in at 151K, missing forecasts of a 180K increase. 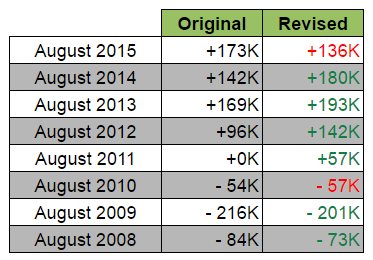 In addition, job creation weakened relative to July’s upwardly revised 275K reading. Average hourly earnings also only grew by 0.1%, slowing down from July’s 0.3% rate of increase and missing expectations that wages would grow by 0.2%. Even the jobless rate was a miss, since it held steady at 4.9% instead of dipping lower to 4.8%. Meanwhile, the labor force participation rate held steady at 62.8%, so working-age Americans weren’t encouraged enough to join or rejoin the labor force. Overall, the August NFP report was pretty bad all around, which is why the Greenback slumped as a knee-jerk reaction. However, the Greenback was later bought back up again. What’s up with that, yo? Well, in my previous Forex Preview, I also commented that “an actual reading above 100K would probably be good enough” because that’s the number of jobs needed to keep up with working-age population growth, according to several Fed officials. As such, the Fed was still on track for a December rate hike. 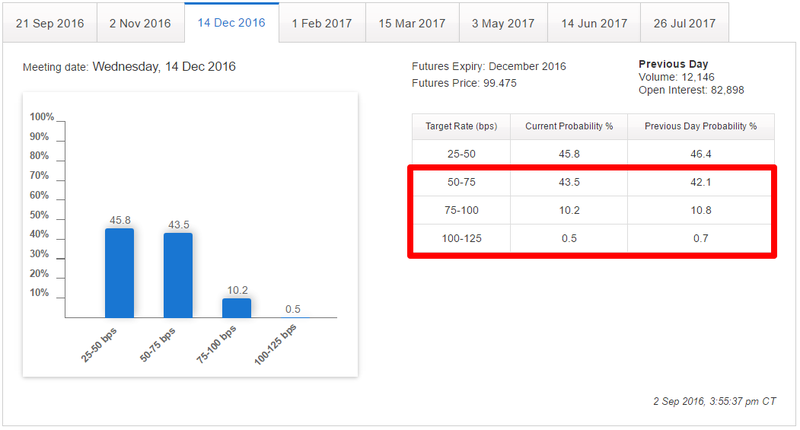 And proof of this can also be seen in the CME Group’s FedWatch Tool, since the probability of a December rate hike actually improved from 53.6% to 54.2%. By the way, if you’re not familiar with the FedWatch Tool, you can check out my handy guide about it here. For this Friday’s September NFP report, most economists forecast that non-farm employment will increase by 170K. Economists are therefore expecting employment to grow at a faster rate compared to August’s 151K increase. The jobless rate, meanwhile, is expected to hold steady at 4.9%, but wage growth is expected to accelerate to 0.3%. Okay, let’s take a look at the available labor indicators, shall we? Moving on, ISM’s manufacturing PMI jumped to 51.5 after dipping to 49.4. However, the employment index indicated that job shedding continued, given that the reading came in at 49.7. But on a more upbeat note the reading for September is an improvement compared to August’s 48.3. As for ISM’s non-manufacturing PMI, it soared from 51.4 to 57.1, and the employment index soared as well, from 50.7 to 57.2. Of the 62 non-manufacturing industries, 9 reported an increase in employment while 5 reported job losses, with the rest reporting steady employment levels. Finally, the September ADP report printed an increase of 154K jobs, which is fewer than the expected 166K increase as well as the previous month’s downwardly revised 175K increase. Overall, the available leading indicators are mixed since Markit and ADP are pointing to another round of weaker job creation in September while ISM is saying that employment levels fell in manufacturing but saw a net increase in the non-manufacturing sector. The leading labor indicators seem to lean more towards a possible downside surprise, though. Oh, also note that like the August period, payroll numbers for the September period tend to be lower due to seasonal adjustments. Moreover, the actual seasonally-adjusted reading tends to miss expectations. But on the brighter side of things, seasonal adjustments also mean that the previous reading usually gets an upgrade. As usual, just remember that the Greenback generally stages a quick rally if the actual reading for non-farm employment come in better-than-expected. Conversely, forex traders normally dump the Greenback when non-farm employment is a miss. And a good example of the later would be the Greenback’s reaction to the previous NFP report. For follow-through buying or selling, keep in mind that a 100K increase in non-farm employment is the floor that most forex traders are probably keeping their eyes on. If the actual reading goes below that, then we can probably expect more follow-through selling. But if the actual reading is above 100K, then follow-through buying is more likely. Of course, that would also depend on the other labor indicators, with wage growth being the likely focus. And if you’re asking what’s up with that 100K floor, well, according to Fed Head Yellen herself, “To simply provide jobs for those who are newly entering the labor force probably requires under 100,000 jobs per month.” In short, it’s the number of jobs needed to keep up with working-age population growth. It’s also the bare minimum needed to keep December rate hike expectations alive. Speaking of rate hike expectations, an increase in non non-farm employment of at least 150K would probably improve rate hike expectations. After a reading of 150 would be “very encouraging,” according to some Fed officials, including Atlanta Fed President Dennis Lockhart.